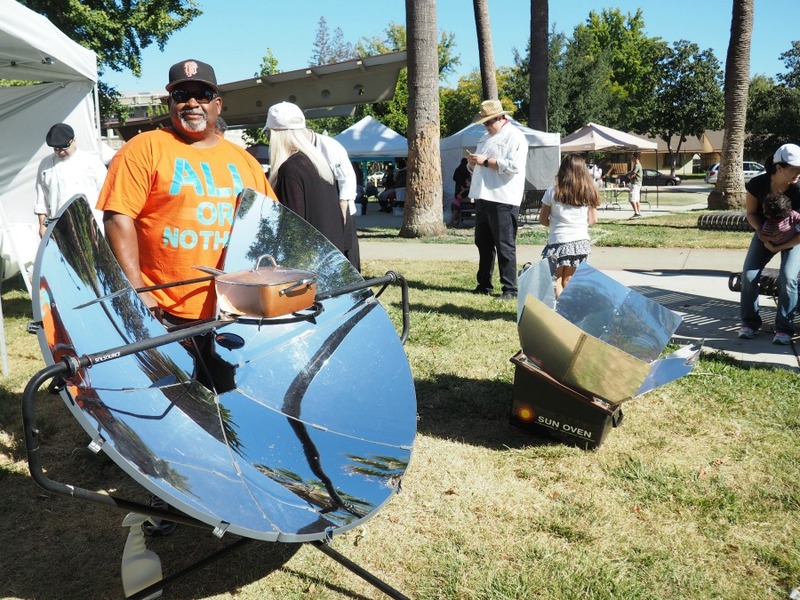 The sun was shining brightly when I arrived at the farmer’s market, which was a very good thing since I was there to participate in a solar cook-off as part of Sacramento, California’s Farm to Fork event. I had been asked to be a sous chef for a local chef in a friendly Iron Chef style competition in which chefs would be given a certain amount of time to create a three-course breakfast menu for a hungry crowd using a basket of fresh mystery selected by the judges from the farmer’s market. Upon arrival I was introduced to Chef Eddie, whom I was slated to help for the day. 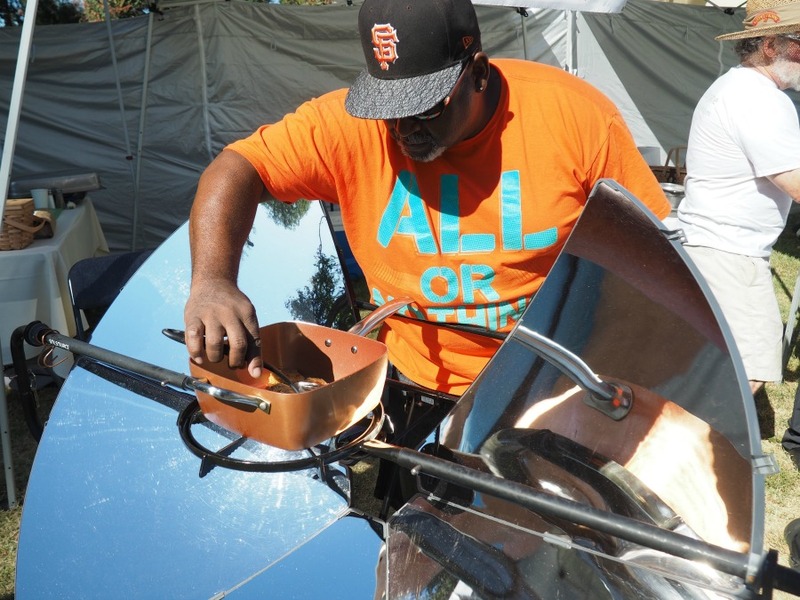 The host took us to our workstation, which had a table with all of our kitchen tools and ingredients, and a solar cooker that looked similar to a big, shiny satellite dish–the SolSource Classic. “You’ve used one of these things before, right?” he asked me. I had not; I thought he knew how it worked! We were given a quick tutorial about how to use the SolSource, which would be my stove for the competition. 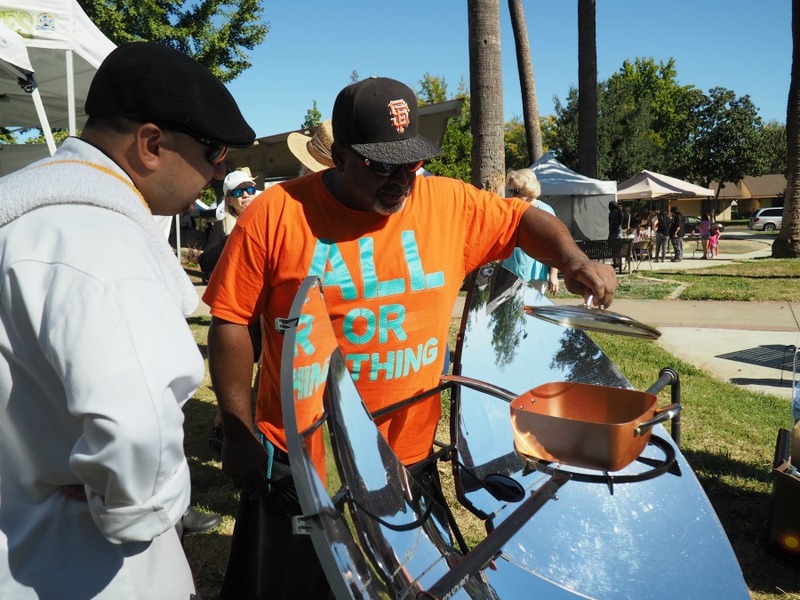 The grills were already set up to reflect sunlight into concentrated cooking power, and the instructions were simple. To adjust the temperature up or down I only needed to rotate my SolSource back and forth a mirror below my pan reflected the sun’s focal point in the middle of the pan (for high temperatures, like frying) or off to one side if I needed to cool off. Without any further instruction, it was time to cook. For our first course, Chef Eddie decided we would make a “mac and cheese” risotto. Have you ever made risotto? I have, and I know firsthand how finicky it can be. I was a little nervous, but I did what the chef asked, using beet tops and garlic to make a quick stock and then adding it bit by bit to arborio rice. To make the stock, I moved the SolSource until I could see the sun centered on the bottom of my pan and within a few minutes my stock was at a rolling boil. To cook the rice, I needed a gentler heat, so I turned the reflectors until the sun was at the edge of my pan, which took the heat down enough to let the hot stock soak into the rice grains rather than steaming off into the breeze. With five minutes to go our rice was tender, hot, and ready to add butter, cheese, and cream for the “mac and cheese” effect. So far, so good. While the judges and the crowd enjoyed our risotto, we got back to work on the second course. It hadn’t even been an hour, but I already felt completely comfortable cooking on the SolSource and I was ready for whatever came next. And Chef Eddie decided that what came next was vegetable hash with a fried egg. A hash is a simple dish to cook; you just dice up some vegetables and let them crisp up in hot oil. The secret is in getting the oil hot enough to cook the vegetables and not stirring them too often (they’re best when they have time to crisp up on the sides). I adjusted the light back to hit the center of my pan and threw the vegetables in with a big glug of olive oil. They immediately started to sizzle. As I waited to stir the vegetables, I realized that although I’d been working hard and standing in the sun over a grill for over an hour, I wasn’t overheated and sweaty like I usually get when I grill. The SolSource was getting really hot, but all the heat went into the pan and the food, it didn’t spill over to me. Even though I’d been leaning over the reflectors and moving them with my bare hands, I hadn’t gotten burned because all the heat was focused on the pan, so everything else stayed cool to the touch. And I wasn’t getting smoke in my eyes (I am a magnet for BBQ smoke) because there wasn’t any. No wonder I was feeling great! 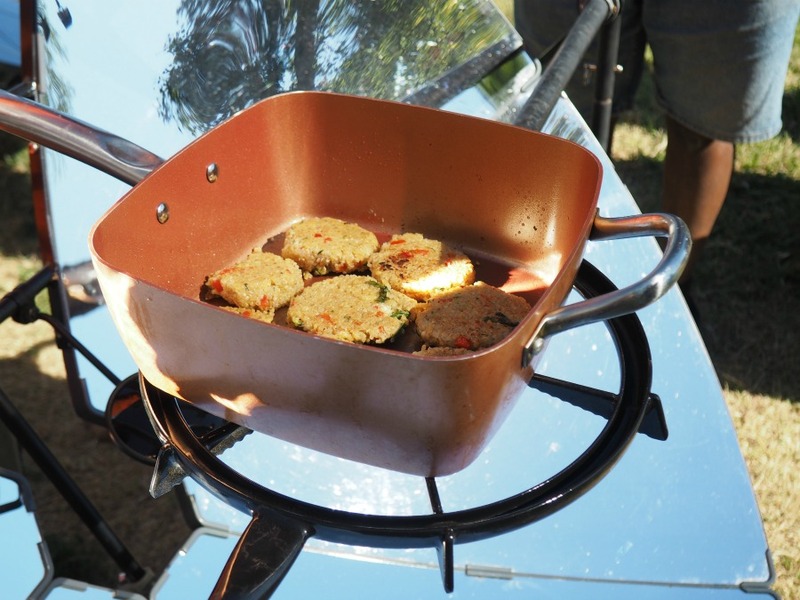 Just before it was time to turn in our second course came the big test–could we fry an egg on the ridged SolSource grill pan? Even though the pan is non-stick, we poured in some oil to hedge our bets, cracked an egg, and closed the lid to let it firm up. I moved the grill around to focus the sun directly underneath the egg, and the coolest thing happened. As I moved the focal point across different parts of the egg, the egg white turned from clear to opaque–I could actually see the egg cook where I was focusing! With a big smile on my face, I cooked around the outside edge of the egg first to stop it from spreading, then worked my way in so that the egg had a fully-cooked white with a nice crispy edge and a still-soft yolk. And we shouldn’t have worried about getting it out of the pan. Even with the ridges, the egg slid right out. For dessert, Chef Eddie wanted to make a sweet-savory grilled cheese sandwich with fruit compote and local honey, so we used our SolSource to quickly cook down some fresh peaches and grapes to a jammy texture, then we wiped the pan clean and grilled our sandwich, using a big pat of butter to make sure the grill marks would really stand out on the bread (they did). 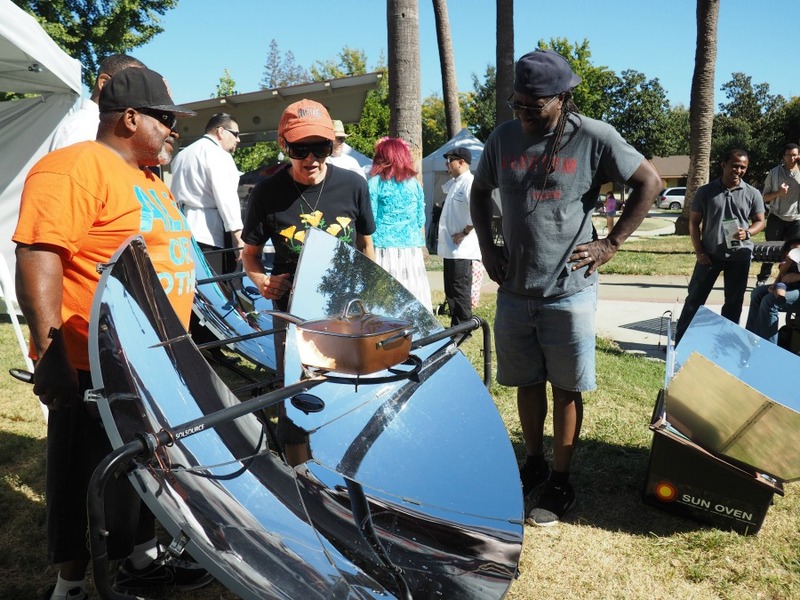 In the space of three hours, two people who had never used a solar cooker before had used it to make three completely different dishes using the whole gamut of cooking techniques. It hadn’t mattered that neither of us had used a SolSource before, because it was so simple to use. In fact, we won! 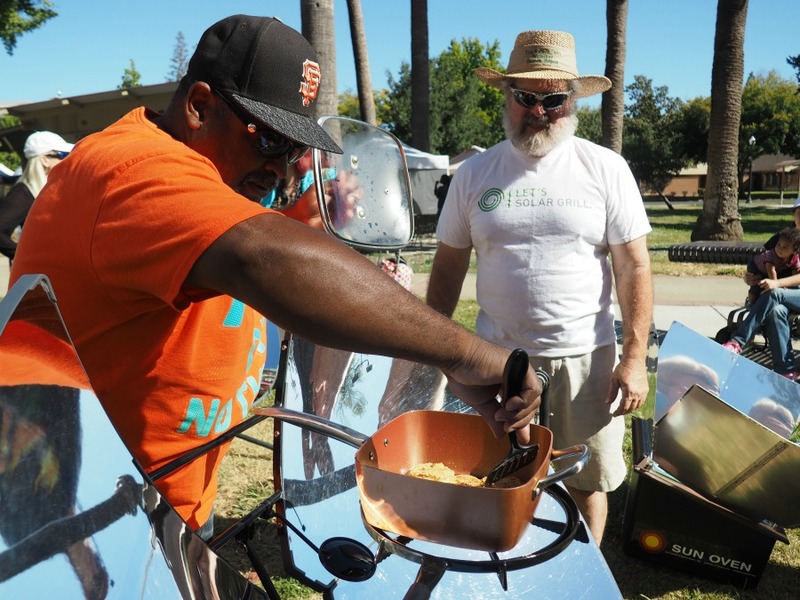 While Chef Eddie’s delicious dishes were the key to our victory, learning to cook on SolSource made the day extra sweet.